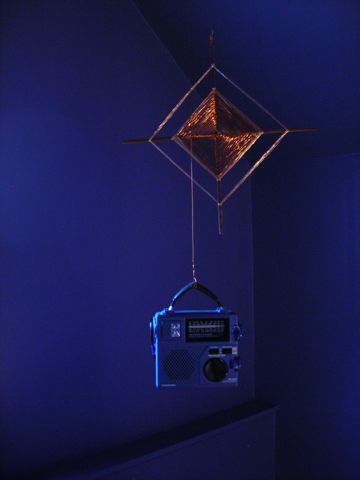 Anna Friz is a sound and radio artist // anna friz » Domestic Wireless, Dust. Site-specific work created for the Leona Drive Project, October 22-31, 2009, in Willowdale, Greater Toronto. Initial concept created in collaboration with Jason Rovito, developed and realized by Anna Friz. (Gaston Bachelard, The Poetics of Space). The modern house provides shelter from the elements (as traditionally conceived), but nonetheless remains porous to those technological elements which are unique to urban existence. Of particular note: wireless communication signals carried on wavelengths across the electromagnetic spectrum which penetrate the house in the guise of radio, television, and mobile telephony. Far from immaterial, these signals shape and colour the affective dimension of domestic space, both in the immediacy of their reception and in the manner in which they accumulate and overlap over historical time. Focusing in particular upon the most recent iteration of this phenomenon–namely the example of the commuter who calls home from her/his mobile phone to say “I’ll be home in five minutes”–I propose to investigate the manner in which anticipatory wireless signals modulate the overall mood of the house; of a house–9 Leona Drive–itself on borrowed time. The Leona Drive project is a site-specific exhibition in a series of six vacant bungalows slated for demolition by Hyatt Homes, a developer in Willowdale, Ontario (in the Yonge and Finch area of Greater Toronto). The exhibition artists will be working in a variety of media: audio, cell phones with GPS, architectural installation, projection, photography, sculpture and performance for a period of two weeks, from October 22nd – 31st 2009. The overall problematic for the exhibition is the remarkable shift from the suburbs of old to the suburbs of contemporary Canada, namely the neighborhoods and precincts of the multicultural, but nonetheless parsed state.Through the Leona Drive project, we are investigating recent developments in suburbia where new patterns of community and conscience operate. Domestic Wireless, Dust, locates the wireless unconscious in the upper-most part of the house (the carpeted white-gray bed room), where I am installing a multi-channel sound and radio installation to amplify (and thus materialize) this affective source. Five “emergency preparedness” transistor radio receivers are suspended from the ceiling overhead. 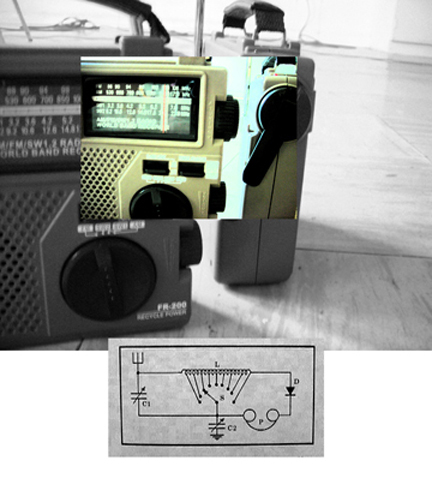 The radios (tuned to 4 FM frequencies) emit composed sounds (transmitted on 4 micro-watt FM transmitters), as well as heterodyne oscillations and multi-path harmonics resulting from interference between the transmitters and interfrequency noise occurring on site. The fifth radio is set to receive incidental sounds from inside the house. The composition is based on intercepted electromagnetic activity and radiation recorded on site, and historical samples from radio and television, and recorded telephonic communications. Additionally, the piece includes handmade antennas riffing on the 1920s Lee de Forest loop antennae and a childhood craft project known as Ojos de Dios, or god’s eyes. The room has been painted deep nova blue and the carpet taken up to reveal the pine wood floor boards. Domestic Wireless, Dust tunes the room to become an apparatus of reception that monitors both interior and exterior, past and present space.